So … it’s been awhile since I’ve posted anything. Partially, it’s because I’ve started a new (well, returned to an old) job, which has freed up my evenings a bit, which in turn has gotten me back to work on my novel. Which is the other part of “partially,” really. All good news, then, being that I’m happier at work and finding time to write. Some people don’t want to bother with self-publishing and I certainly understand that. Others treat the idea of working toward traditional publication as some sort of idiocy. It’s each author’s prerogative to steer their own career. For us, I believe hybridization is the way to go. And then goes on to explain why. It’s good, thought-provoking stuff, and a post I’ll definitely re-read when it comes time to decide what I want to do with my novel. I think ideas are the easiest part of it. A lot of people believe, “I could be a great novelist or a filmmaker if I had just one good idea.” But really, I think the execution is more important than the ideas. An idea is just an adhesive that you use to stick a reader to a character. But the adhesive doesn’t last for very long. And then if the reader hangs in, they’re only hanging in because they care about that character. It’s almost like—the best and worst bubblegum is Juicy Fruit. Because it tastes so good when you first chew into it, but the flavor goes out of it after about 30 seconds, and then you’re just chewing this nasty lump of concrete. And a good concept can be a little bit more interesting than a stick of Juicy Fruit, it can have a little bit more flavor to it. But I do think all the nutrients are in characters. The satisfying meal is who these people are. The thing I like about Whedon’s work is, he’s always very careful to give every character their moment. A moment where they will stand revealed as hero or villain or clown. And that’s what I believe about both literary fiction and genre fiction: You can have great setpieces and a great concept, but people really want to fall in love with characters. They even want to fall in love with your bad guys. Defiance has shown the spotlight on each main character briefly, but I don’t think any of them—including the main character, Nolan—have had their “moment” yet. But I digress. 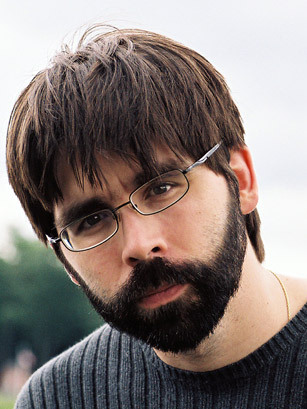 The point is, there’s a lot of gems of writing wisdom in that Joe Hill interview. Go read it. So, apologies for the long silence. In the future, I’ll try to be a little more bloggy. (It’s a word … now …) I’ll at least try to remember to share inspiration, tips, and interviews with great writers as I find them. Until then—keep writing! « What is your creative process? You are currently reading A couple of things at Kicking the Pants.